At this point in our search for the ultimate Mai Tai, we had all but given up hope at finding a ten-star Mai Tai on Oahu. We'd been to the Halekulani, the Royal Hawaiian, and Jamesons. Those were all very good Mai Tais, but each had that little something that separated it from perfection. 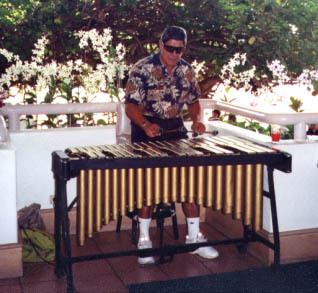 We made the pilgrimage of a lifetime when we strolled over to the New Otani for the lunchtime performance of Exotica legend Arthur Lyman. The Sunset Lanai is just off the lobby and features a small lounge area and a bar. It is very open and overlooks the Hau Tree Lanai which is down a short flight of stairs and sits under Banyan Tree made famous over a hundred years ago by Robert Louis Stevenson. Technically (I think), I sat in the Sunset Lanai, but I received receipts from both "locales" so the difference is pretty minimal. As we waited for Arthur Lyman to start playing, we ordered our New Otani Mai Tai. It was served in an old-fashioned glass, topped with slices of pineapple and lime, along with a cherry. It was dark yellow with a dark rum float, and filled with crushed ice. I drank it, anticipating a little something here or a little something there which would detract. Hmmm... nothing but great taste. I tried it a second time, then a third. Next thing I knew I had finished the thing and was left saying "more, please..." The second Mai Tai I ordered was just as great. It didn't look any different from the quality Mai Tais at the other establishments, but it sure tasted better! It was very potent, but so very, very smooth to drink. I was so impressed, I went over to Gerry the bartender and asked what was in the Mai Tai. He said they use Diamond Head Rum, Bacardi Superior, pineapple juice, orgeat, sweet & sour (a big surprise to me), orange Curacao, and amber and dark rum. Definitely the best tasting mix in Waikiki and the only 5 star taste on the island. 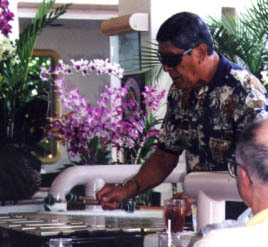 The Mai Tai was almost great enough to overshadow the star of the day, Arthur Lyman. 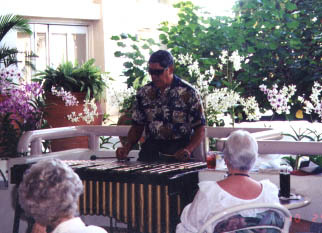 Lyman started playing Vibes in Martin Denny's group in the mid-50's and he still plays great today. He played two sets, separated by a 20 minute break and took requests from the strong of people paying homage to the master! We didn't mention the great views from the Hau Tree Lanai or the great service or the just plain great "vibe" of this place, but I think you get the idea. Friday afternoons at the New Otani, listening to Arthur Lyman and drinking the best Mai Tai in Oahu is about a good as it ever gets in life!